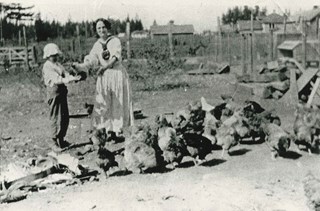 Photograph of (left to right) Jack Gillmore and his mother, Jean Gillmore, feeding some of the 2,000 chickens on Red Feather Poultry Ranch on Keefer Road (later becoming 6350 McKay Avenue). The ranch was founded by Charles Reginald Gillmore. Charles R. Gillmore was married to Jean Leslie Mills and was a principal in Gillmore, Mills & Co. of 170 Water Street in Vancouver. 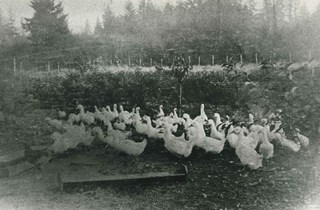 Photograph of ducks on the Red Feather Poultry Ranch located on Keefer Road (later becoming 6350 McKay Avenue). The long ranch house is faintly discernable in the background. The farm was operated by Charles R. Gillmore. 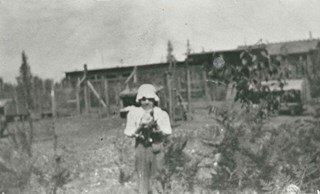 Photograph of Jack Gillmore holding a bantam. The long ranch home and chicken pens can be seen. 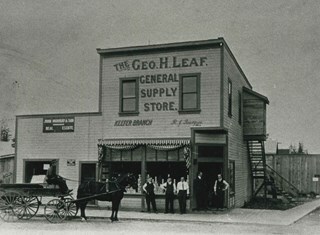 Jack was the son of Charles R. Gillmore who operated the Red Feather Poultry Ranch on Keefer Road (later becoming 6350 McKay Avenue).